From Kansai International Airport, walk 1 minute to the Kansai Airport train station, and take the JR Limited Express Haruka 4 stops to Kyoto. 3490 JPY, About 75 minutes. From Kansai International Airport, walk 1 minute to the Kansai Airport train station, and take the Nankai Rapit Limited Express 6 stops to Shin-Imamiya. From Shin-Imamiya, take the JR Kanku Express train bound for Tennoji 3 stops to Osaka. From Osaka, take the JR Tokaido Main line limited express train bound for Yasu 3 stops to Kyoto. 2280 JPY, about 106 minutes. From Kansai International Airport, walk 1 minute to the Kansai International Airport bus stop, and take the bus to Osaka-Ekimae (Hankyu Umeda bus stop). From the bus stop, walk about 7 minutes to JR Osaka station. From JR Osaka station, take the JR Tokaido Main line limited express train bound for Yasu 3 stops to Kyoto. 1840 JPY, about 106 minutes. Directions from Kyoto station can be found here. From Osaka International Airport (Itami Airport), walk 1 minute to Osaka Airport bus stop and take the bus to Kyoto Station. 1280 JPY, about 75 minutes. 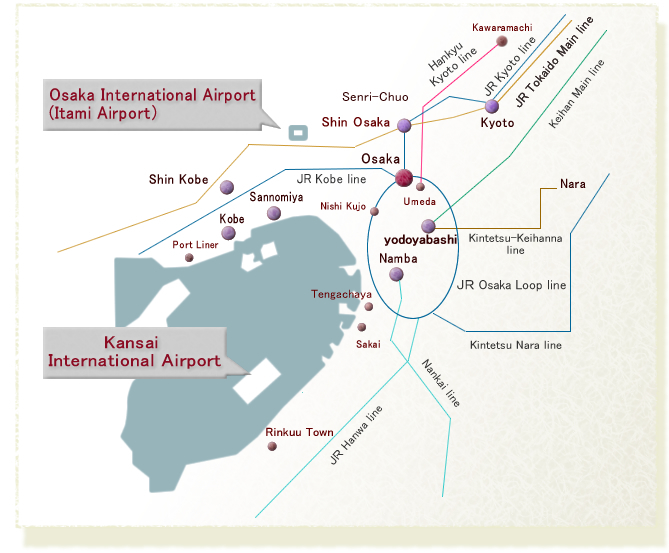 From Osaka International Airport (Itami Airport), walk 1 minute to Osaka Airport monorail station, and take the monorail bound for Kadoma-shi 1 stop to Hotaru-ga-ike. From Hotaru-ga-ike, take the Hankyu Takarazuka main line express 3 stops to Umeda station. 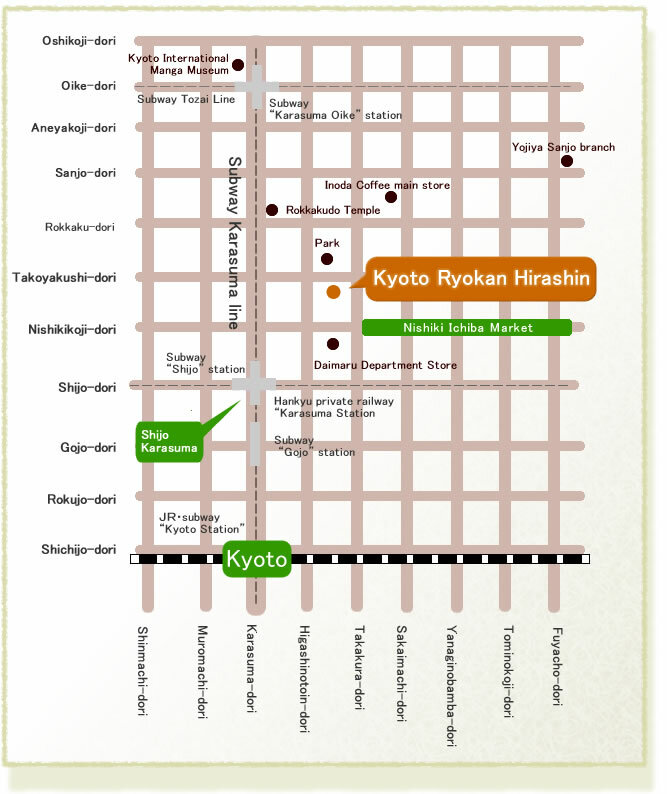 From Umeda, walk 3 minutes to JR Osaka station, and take the JR limited express 2 stops to Kyoto. 2100 JPY, about 70 minutes. From Narita International Airport, walk 2 minutes to Airport Building No. 2 station and take the bus (call system) to Tokyo Station. From Tokyo station, take the JR Bullet Train Nozomi 4 stops to Kyoto. 16,250 JPY, about 2 hours on the bullet train and 4 hours total. 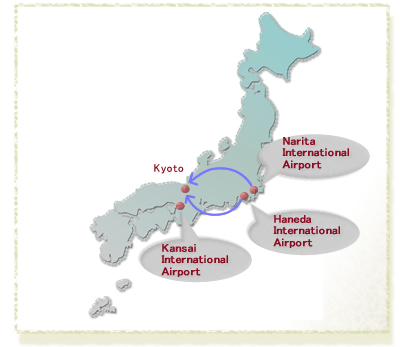 From Narita International Airport, walk 2 minutes to the Airport No. 1 buliding bus stop, and take the highway bus to Kyoto Station. 8500 JPY, about 9 hours. Take a Keikyu Airport Limited Express Train from the International Flight Passenger Terminal Station at Haneda Airport International Terminal. Get off at Shinagawa Station, a 13-minute ride. Transfer to a Nozomi Shinkansen train and get off at Kyoto Station, three stops from Shinagawa Station—about two hours and 14 minutes. The ticket will cost 13,520 JPN. It will take about three hours to Kyoto in total.